Since its founding in the eleventh century, the oldest of the Scandinavian capitals has grown into a major European trading center. In addition, the spectacular setting at the head of a 110-km fjord, nightlife along the quay and medieval buildings make it a tourist’s dream come true. Advice: The food in Norway is expensive but delicious. Try more than just salmon, which one can normally get back home. Also try Norwegian strawberries! Favorite hotel: Rica Victoria, Rosenkrantzgtaten 13, P.O. 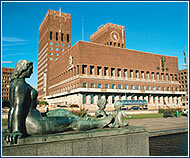 1718 – Vika, tel: + 47-2414 7000 – Close to the town hall, near the fjord. Beautiful view over the whole city and fjord; fresh seafood and other delicacies either to choose from Swedish tables or a la carte. Favorite shops: Bookstore Tanum on Karl Johans gate 37, tel: +47-2241 1100 – A huge shop with shelves to the ceiling. You can spend a whole day pleasantly here. A bar near town hall furnished in original English style with many beautiful antique things. Large selection of different beers from around the world. Advice: In the morning go to the harbor next to town hall, buy a bag of freshly boiled shrimp from the fishermen. 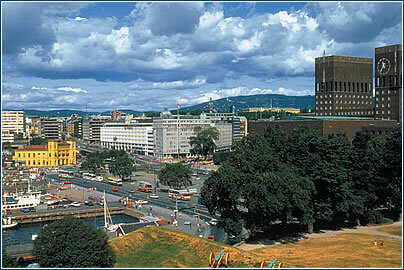 If you really want to enjoy Oslo, go at the end of June for the Midsummer festivities. Favorite attraction: A trip on a historic Viking boat around the fjord. 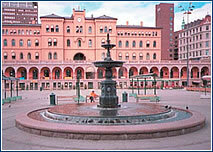 Favorite shop: Shopping center Aker Brygge. Originally it used to be a harbor, today it’s home to boutiques and cafés. Advice: Norway is quite expensive; take a lot of money. 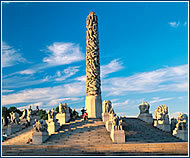 Favorite attraction: Summer walk in Frogner park, Bygdoy peninsula with the Kon-Ti-Ki raft, Framem ship and Vikings’ boats. 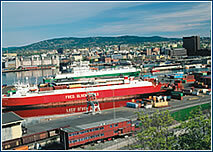 Best-kept secret: The geografic center of Oslo lies in the middle of forests called Nordmark. It’s nice to take the metro to Holmnekollenganen to the last station, walk throught the forest and visit local restaurants (no alcohol offered). Advice: During nice weather sit by the docks in Aker Brygge, have a beer and watch the sea and summer life in Oslo. Religion: 86% Evangelical Lutheran, 3% other Protestant and Roman Catholic, 11% other/unknown. Time zone: GMT + 1 (GMT + 2 from last Sunday in March to Saturday before last Sunday in October). Electricity: 230 volts AC, 50 Hz; two-round-pin plugs are standard. Average January temp: – 4.3° C (24.3° F). Average July temp: 16.4° C (61.5° F). Annual rainfall: 1,045 mm (41 inches). http://www.oslopro.no/index_eng.html – everything you need to know about getting around the city, in the form of an interactive map. 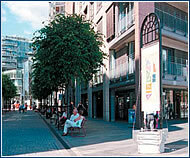 There are few large companies in Oslo; only about 5% have 100 employees or more (the state owns in whole or part major companies). One of the main players is Siemens, along with the telecom giant Telenor, which was involved in the specification standards for the first GSM test system. As befits the country that developed the original prototype of the mobile phone, there is a superb technological infrastructure with some 80% of employees having access to a computer – a significantly higher figure than elsewhere in Europe and even the USA. Dress conservatively in a smart business suit and shake hands with everyone present on arrival and departure. Appointments should be made well in advance and adhered to. After the exchange of business cards and formalities, it is straight down to business. Expensive gifts should be avoided; small items bearing the company logo would be suitable and bringing in the duty-free alcohol allowance will be well appreciated.